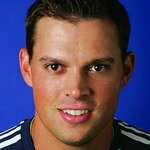 Join Olympic Gold Medalist, US Open, Wimbledon, French and Australian Open Champions, Bob & Mike Bryan on Friday, September 27, for a one-of-a-kind All Star Tennis Festival with a Pro-Am Doubles Tournament. The 35-year-old twins will be returning to their hometown of Camarillo for the V-Grid Tennis Fest Featuring the Bryan Bros. and presented by Alexander Cadillac. All proceeds will benefit the Bryan Bros. Foundation. The day of music, food, wine, and – of course – tennis will take place Friday, Sept. 27 beginning at 4:30 p.m., at the Spanish Hills Country Club and will feature special guest Andy Roddick, as well as other top names in tennis. More than 50 local wineries and restaurants will be on hand and sponsorships are still available. Last year’s event was attended by special guest Gavin Rossdale of the band Bush and more than $100,000 was raised for the Bryan Bros. Foundation. Enjoying his first year off in retirement, Roddick said recently that he’s looking forward to joining his former US Davis Cup teammates in Camarillo. “The Bryans do so much great work with their Foundation and have always helped when I’ve called on them,” he said. For more information on the Bryan Bros. Foundation see the website at: BryanBros.com.